At the very beginning, results are slow. They’re still testing out the waters and figuring out how everything works. This is to be expected. But many others stick with it, and after a little trial and error, they see some level of success. They spend $5/day and make $10/day. Then they scale up to $10/day, $20/day, $50/day. And they continue to generate a decent-to-good return on ad spend (ROAS). Once they reach a certain point—it varies from company to company but could be anywhere from $10,000-$30,000 or more per month—they start to have problems. The more they scale up their campaigns, the more their CPA (cost per acquisition or cost per sale) creeps up…until they realize they’re actually losing money on Facebook. When that happens, they scale back down and try to figure out where they went wrong. But then they run into another obstacle: because of the way Facebook’s algorithm works, it isn’t always easy to test different variations with the amount of control you need to find out which ads are working best with which audiences. And that makes it really hard to scale. When this happens, you feel stuck. You don’t know exactly what went wrong, and even worse, you don’t know how to move forward to fix things. I’ve seen this problem a lot. But before I tell you how we solve it, let me explain the root cause of what’s going on here. When you create a Facebook campaign, you choose a goal. Do you want Facebook to optimize for traffic, brand awareness, conversions, video views? This is common—it definitely seems to be the most common campaign goal inside Facebook. And Facebook is GOOD at doing that! Facebook won’t always necessarily mix and match different creatives with different groups of people inside of an ad set. If you create an ad set like this and let it run, until very recently Facebook would quickly zero in 1-3 ads that it prefers. And those ads will get the majority of your impressions, while the majority of the ads got very little traffic. Meanwhile in the background, the algorithm is figuring out what kind of people are most likely to respond to those ads. If your ad set has a potential reach of 5 million people, Facebook isn’t showing your ads to all 5 million people—it’s looking for sub-groups that are more likely to respond. This is great! Because Facebook has figured out something that works. And it will show Ad 4 to people with Interest 9 all day long, and you will generate sales at a profitable ROAS. Everything will be great. Because the problem here is that there are only so many people who match Interest 9. And when you raise your campaign budget past a certain point, Facebook will eventually run out of those people to show your ads to. And that’s a big reason why your ROAS tends to go south when you try to scale up. Another problem that trips people up (and most advertisers don’t even realize this) is the issue of audience overlap. 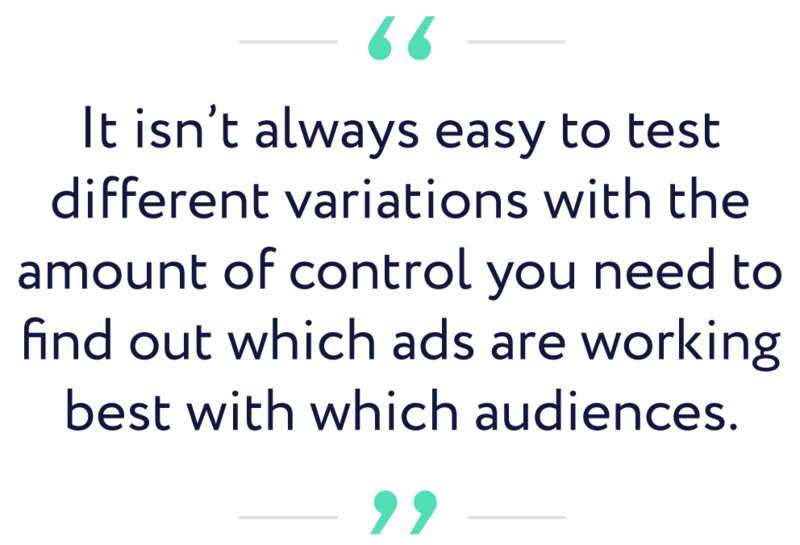 Audience overlap is just what it sounds like—it’s what happens when 2 or more of your ads sets have an overlapping audience. In other words, they’re targeting some of the same people. 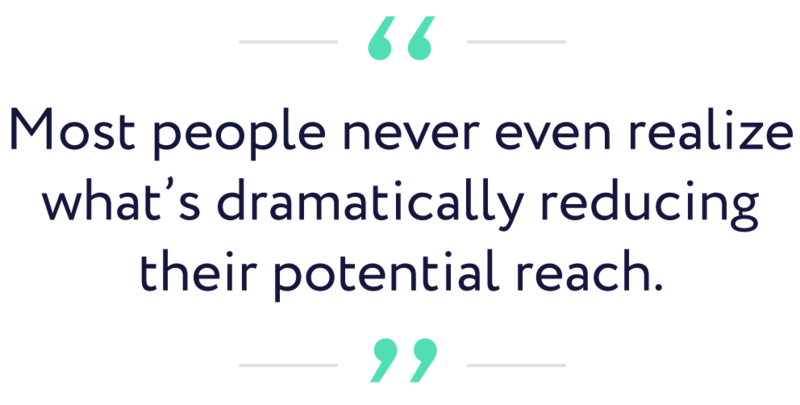 When you have audience overlap between ad sets, it will reduce the reach of some of those ad sets—but you won’t necessarily realize this is happening. Instead, all you will know is that your new ad sets aren’t working. Their ROAS is low, and if you take time to dig through the metrics, you’ll probably notice that your reach is lower, and your frequency is higher than you might expect. That’s because the potential reach for that new ad set is misleading. It may say your potential reach is 1 million people, but if 900,000 of those people are overlapping with a better-performing ad set, then your true potential reach is only 100,000. 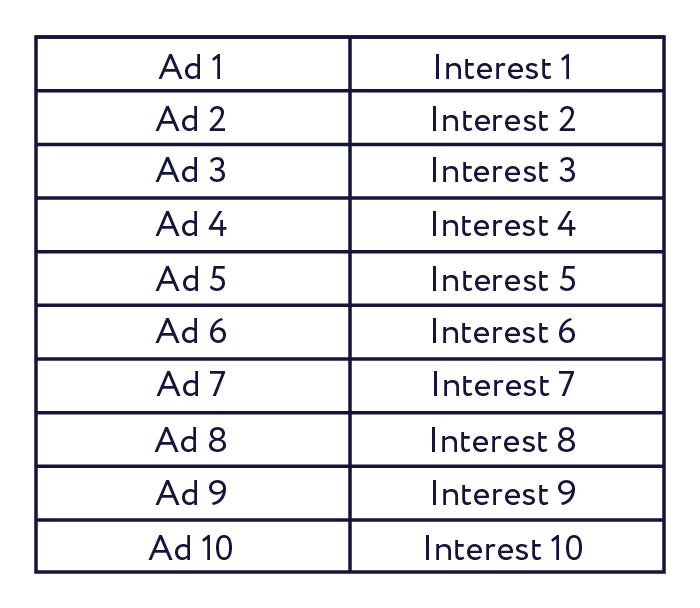 This is another reason why many Facebook advertisers find it hard to scale—because Facebook is excluding their new ad sets from the auction due to audience overlap, dramatically reducing their potential reach. And to make matters worse, most people never even realize this is happening. Luckily there is a solution to both of the problems I described above. But before we get into it, I should start by saying that the strategy I’m sharing below is not for first-time Facebook marketers. If you’re just starting out with Facebook advertising, this is NOT where you want to begin. Now we know that Ad 4 works with Interest 9, but that doesn’t mean that other ads wouldn’t work with other interests. It could be that Ad 6 really appeals to people with Interest 1, or that Ad 5 works like gangbusters on people with a combination of Interests 7 and 8. The question is, how do you actually figure that out? Facebook won’t always do it for you, because its algorithm doesn’t work that way. Facebook wants to generate immediate results and zero in on what’s working as fast as possible—which is great, but it means that Facebook doesn’t always do a good job of stepping back and reassessing the big picture. What we need to do is expand our campaign structure to force Facebook to try all the combinations of ads and interests that we want to test. And when you do this, you actually start to take back some of the control that you were missing in the first place! The goal here is to figure out what ads and messages work best with which segments of your customer base, so that eventually, we’ll be able to get much more targeted with our campaigns—allowing us to scale up across multiple different customer segments (instead of just increasing the budget on one single ad set). 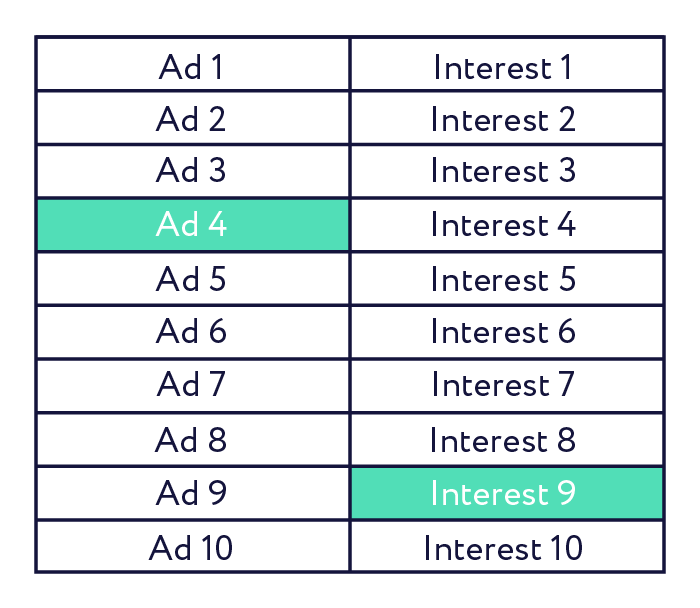 Armed with this information, we would create a brand-new ad set for each of these combinations—an ad set targeting Interest 9 and containing Ad 4, another one targeting Interest 1 and containing Ad 2, and so on. 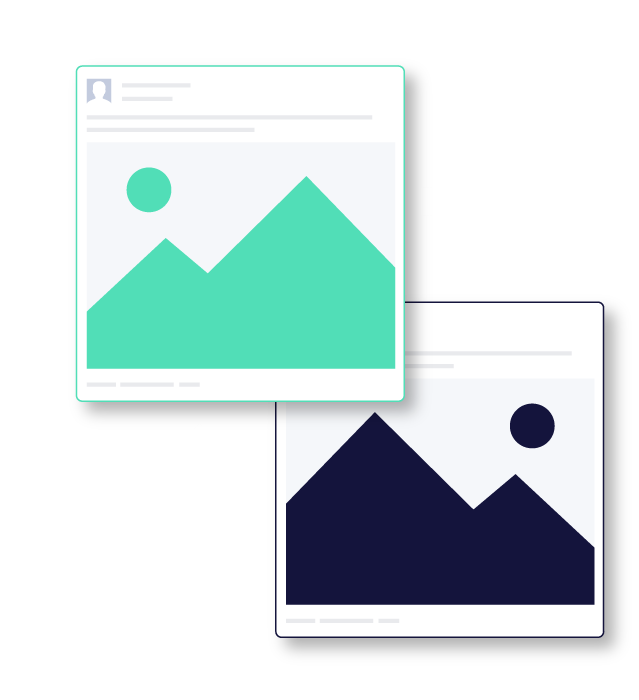 From there we can scale all 5 of those ad sets separately, allowing us to reach many more customers—at a much better ROAS—because we’re putting the Facebook algorithm in a position to succeed. It also helps us to avoid audience overlap, because we’re making each ad set much more targeted. 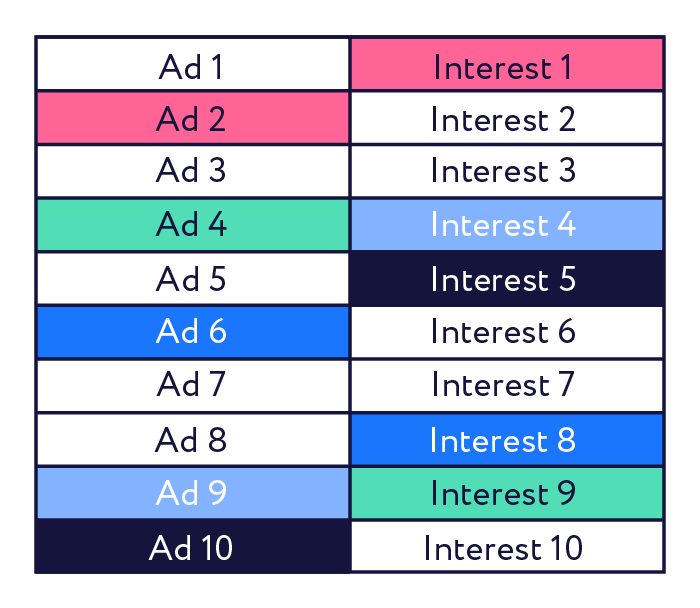 Instead of having a few ad sets that target everybody (resulting in a lot of overlap), each ad set is much more focused and targeted. 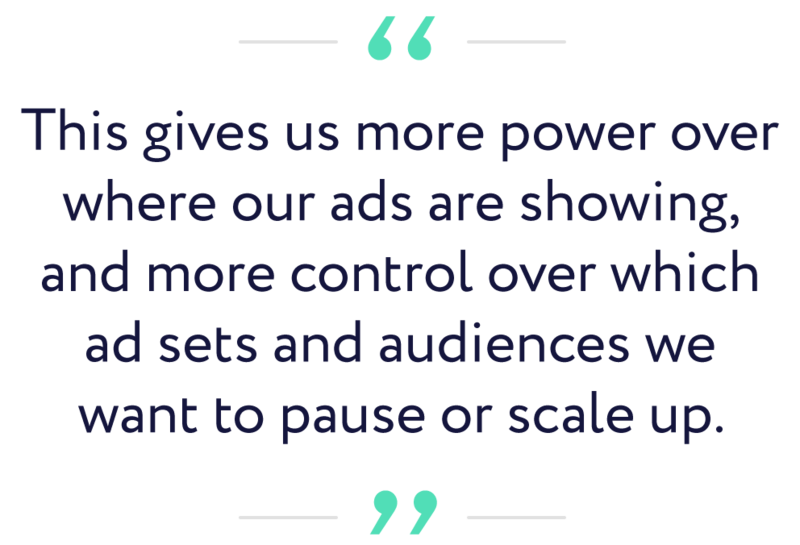 This gives us more power over where our ads are showing, and more control over which ad sets and audiences we want to pause or scale up. At this point you may be thinking, that sounds great…but how do we actually set this up inside of Facebook? There are a couple ways to achieve the campaign structure I just described. Until fairly recently, you had to set this up manually. This required the creation of a separate ad group for each and every ad and audience variation—which means that we were creating 200-300 ad sets per customer. As you can imagine, this takes a lot of work and is something most advertisers won’t take the time to do. But it’s well worth the effort, in our experience. Today though, thanks to some new features—specifically Facebook Split-Tests and Dynamic Creative—you can test this type of thing a lot more easily. I won’t give a click-by-click walkthrough here, because (frankly) Facebook is changing so rapidly that it wouldn’t be long before it becomes outdated. So instead I’ll give you more of a high-level strategic overview of how we use each of these features to achieve some of the head-turning results that you read about it in our case studies. Split testing happens at the campaign level and allows you to set up a true A/B test with non-overlapping audiences to compare the effectiveness of your ads, audiences, placements, and delivery options to find out what works best for your business. 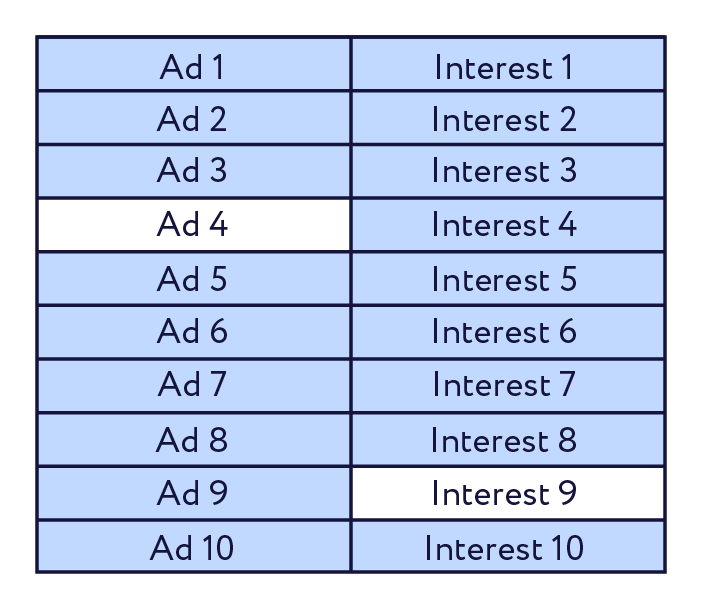 This is a really welcome feature for those marketers who dislike the way that Facebook doesn’t give equal preference to all the different ads in an ad set. The only big pitfall we’ve found with split testing in Facebook is the limited timeframe. Right now, a split test can last 3-14 days, which means that you’ll still have to take the time to interpret your results and adjust your live campaigns based on the results of the test. But even so, it’s a powerful tool we use to help figure out the most effective audience/ad combinations. Dynamic creatives are slightly different. For one thing, dynamic creatives happen at the ad set or ad level. And if split testing is like an A/B test, dynamic creatives are more like running a multivariate test. In other words, this feature will test all the different combinations of your ad components (meaning your videos, images, descriptions, calls to action, headlines, and so on) until it finds the most effective combination of components that resonates best with your audience. This is another tool that helps us to scale up campaigns faster and easier, because we don’t have to manually create hundreds of ads inside of hundreds of different ad sets anymore—we just create the separate components and use dynamic creatives to figure out the best possible ads for each of the audiences we’re targeting. I see a lot of companies who are able to get some initial success on Facebook…but they have trouble scaling it up. That’s because scaling up in Facebook is hard. Keep in mind that on Facebook (as in life), the strategy that gets you to $5,000/month is NOT the same strategy that will get you to $50,000/month, which is NOT the strategy that will get you to $500,000/month. That’s why, when you start scaling up enough to be playing with the big boys, you need to adopt a more advanced and detailed strategy to succeed. You have to understand the principles behind the Facebook algorithm. The algorithm is really, really good at doing what it does—but it can’t do everything. 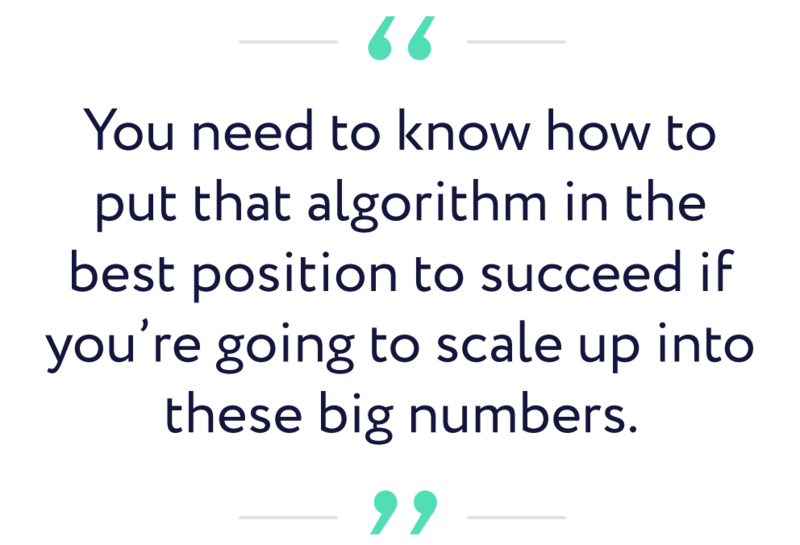 You need to know how to put that algorithm in the best position to succeed if you’re going to scale up into these big numbers. Facebook’s algorithm is like a really good hammer. As long as you use it to pound in nails, you’ll get great results. But the second you start using it to try and chop down a tree, you’re going to get frustrated. Another thing making this difficult is the fact that Facebook’s algorithm is always changing! They are constantly tweaking things to improve it—sometimes they’re big changes, sometimes they’re little changes, and sometimes they’re little changes with big implications. That’s one of the things our customers repeatedly love about working with us—the fact that we’re so in the loop when it comes to advanced Facebook and Instagram marketing. We study this stuff like nobody else, and we have tools available to us that aren’t available to most other people. We have our own Facebook Partner Manager who lets us know of changes before they’re announced online, and we also tend to get access to new tools before they’re publicly rolled out. And you’d better believe we exploit these advantages by making changes fast when we see a new opportunity, leading to quick wins for our customers while the rest of the Facebook marketing world races to catch up! If you’re curious about what kind of results you might get with an agency like us, fill out this quick form to schedule a chat. We’d love to dig into your marketing goals and challenges and see how we can help you achieve more success online.